Aocerbek wall power station is a creative charging device which can automatically identify variety types of electronic device and fast charge several equipments simultaneously. 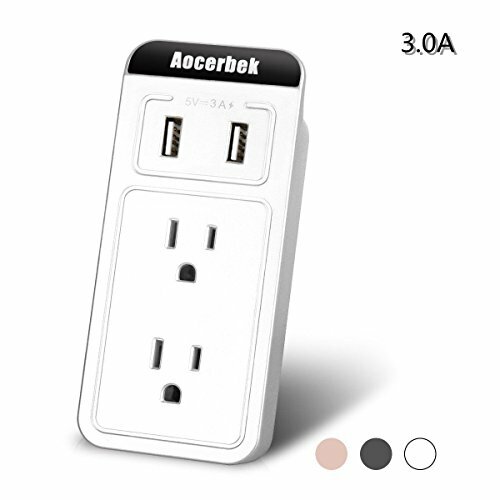 Two AC outlets and two USB ports allows you to power up 4 compatible devices simultaneously. It suits for smart phone like iPhone, Samsung, Huawei, Blackberry and iPod, iPad and tablet. It is convenient for using at home, office, professional workstation, entertainment center, or for a trip. Flame retardant material and integral copper bar protect your devices in safety. Easy to carry and directly mounted to the wall leads less cable chaos risk. Night light design allows you easily find your phone in the dark. Choose Aocerbek Wall Power Station to simply and beautify your life!